This was going to be the one! At 50 pages in, I was sure it was the one I would find myself recommending to all of you regular, non sci-fi readers out there. It wasn't too futuristic, too weird, or too alien. Unfortunately, it gradually slipped that way until I realized there would be a disconnect for most of you at one point or another, and I finally admitted to myself that it will still be a long time before I encounter the book that crosses from my area of interest into one of yours'. 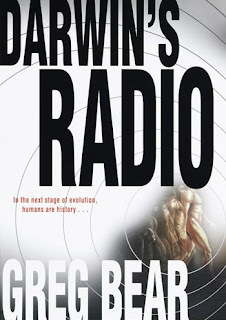 In 2000, Darwin's Radio took the Nebula Award and was a Hugo nominee. My list of books continues...(as it will for quite a while). On the surface, it looked like a very different book than it turned out to be. I thought it would be a spin-off of Outbreak or The Andromeda Strain. Only instead of a disease caused by another species, this time it's a virus which is fragmented and embedded in several different sections of our own DNA, millions of years old, but finally awakening due to some unknown factor. Great hook. I didn't realize that such a thing could happen: useless information in our own DNA, potentially harmful yet replicated and passed on to our offspring. Makes me wonder if scientists could some day purge all of the useless and harmful stuff from our DNA and make it a lot more compact (and I suppose less likely to mutate). Kind of like running disc cleanup and defragmenter on a hard drive, only in our genes. So that's what the story seems like it's going to do. There is a mystery illness, a team of specialists who are the only ones capable of stopping it, mass hysteria, everything right in place. Except that it turns out the virus is not necessarily a disease. What it turns out to be, I won't say, because that tosses the entire mystery of the story out the window, but it could have been part of why I slowly became less satisfied with the book, as well as the fact that it got harder to share as it went. 1. I felt like I missed a whole lot of what was happening. That same writing style that was great for my curiosity also left me feeling like I was not keeping up with everything that was going on. I think it mostly is a result of letting the reader discover things at the same time as the characters in the story. The POV switches back and forth between major characters, usually spaced far apart both in time and location (which is thankfully provided at the beginning of chapters). The knowledge comes in fragments, from various sources, and ultimately a lot of things are left to be guessed at and filled in by the reader. We are kept in the dark as much as the main characters are, so that even at the end I feel like I'm missing things that were just too well concealed between the lines. I want to go back and find out what I'm missing, but I'm not sure there are holes or not. It's that same unsettling feeling I get when watching a Blu-Ray demo, that there is so much information to be glimpsed at each moment that I'm probably missing half of what's there. 2. The main characters are just too stinking lucky. Sure, not everything was roses, but in the end they had their freedom, plenty of money, a healthy child, and buckets of optimism where so many others didn't. Their hunches always turned out right. They started late but were still among the first to succeed in a race where everyone basically goes the same speed. So while I liked them at the beginning, I felt resentful towards them by the end. 3. Humanity seemed a bit too stupid and panicky to me to be realistic. It was great for the drama, but considering the virus didn't kill people (it caused miscarriages, some slight superficial disfiguring, and mysterious pregnancies), I thought the rioting, religious fanaticism, and martial law was overdone. The government also felt distorted into a very heavy-handed and suppressive entity. While again, sure, I don't trust the gov't. much, I do sort of believe that politicians are smart enough that they would handle the crisis better than they do in the novel. Our gov't. may be pretty ruthless and diabolical, but in the end it protects itself and us citizens pretty well. Or maybe I'm just an optimist (hah!). 4. I don't really agree with the choice made by the main characters at the end. To put it vaguely, they embraced a change that I don't feel comfortable with myself. I understand why, I suppose, but I disagree with their choice because it's creepy, and I'm not at all certain it is right. As a result, the book ended on a very dissonant, unsettling note that didn't feel right to me. Maybe that means it is a great book, because it forces me to consider a different viewpoint. I just don't know. But thanks to Wikipedia, I learned that there is a sequel, entitled Darwin's Children, which came out in 2003. Perhaps the resolution I seek can be found there. I'll let you know. Well, I griped and inferred that it was a letdown, but I still enjoyed Darwin's Radio quite a bit. It was gripping, provocative, and creative. A fast-paced book, even if frustratingly slow to bring answers. I was disappointed by some illogical behaviors and dazzled by some scientific insights, annoyed at the main characters while still liking them in all their quirkiness. A mixed bag of contradictions, like something frozen that gets cooked in the microwave and winds up scalding in places with ice still floating in others. But overall, I believe I liked it, and I do plan on looking into that sequel sometime soon. You know, I like books that let me learn along with the characters. I think it's great if the author can fool me just as long as they do the characters, or at least keep me in the dark. Some of those other negatives you mentioned I wouldn't like, but I think the keeping-the-reader-in-the-dark thing is wonderful! Of course, I haven't read this particular one, so maybe i wouldn't feel the same way. But the beginning, when you were talking about how you thought it was going to be one thing but it dissolved into another - that's kind of how I felt about that modern fiction book I reviewed a week ago. Sounds interesting. I don't usually read sci-fi, but I might check it out.